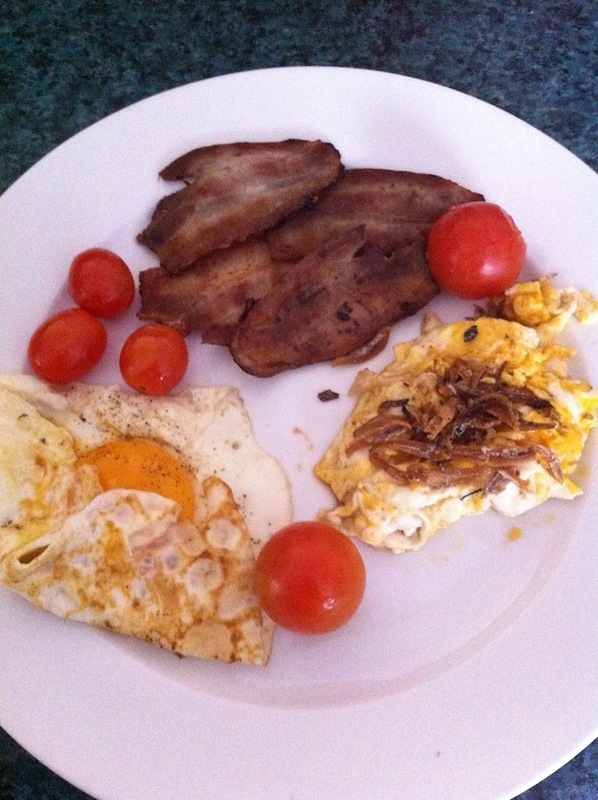 Voila, here it is: my new ersatz nitrosamine-free bacon breakfast, made from pan frying slices of thin-sliced pork I bought from the Korean deli in Vic Park, which were actually prepared for use in Korean barbecue cuisine. It's served up with two kinds of mini tomatoes and eggs cooked two ways - indolently scrambled in butter and slightly shy sunny side up - both liberally laced with Akabanga to help me wake up; plus a sprinkling of ikan bilis (air-fried little anchovies pan roasted with peanuts, which I purchased from an Indonesian take-away place in the same shopping centre where the Korean deli is located, Centro Victoria Park). You can make it look and smell even nicer by adding a sprinkling of dill, fresh shredded basil or some other herb. But I was too sleepy and too hungry to bother.